"Open your mind...harmonious convergence...Transcend the ordinary..."
From a breakfast cereal? Seriously? 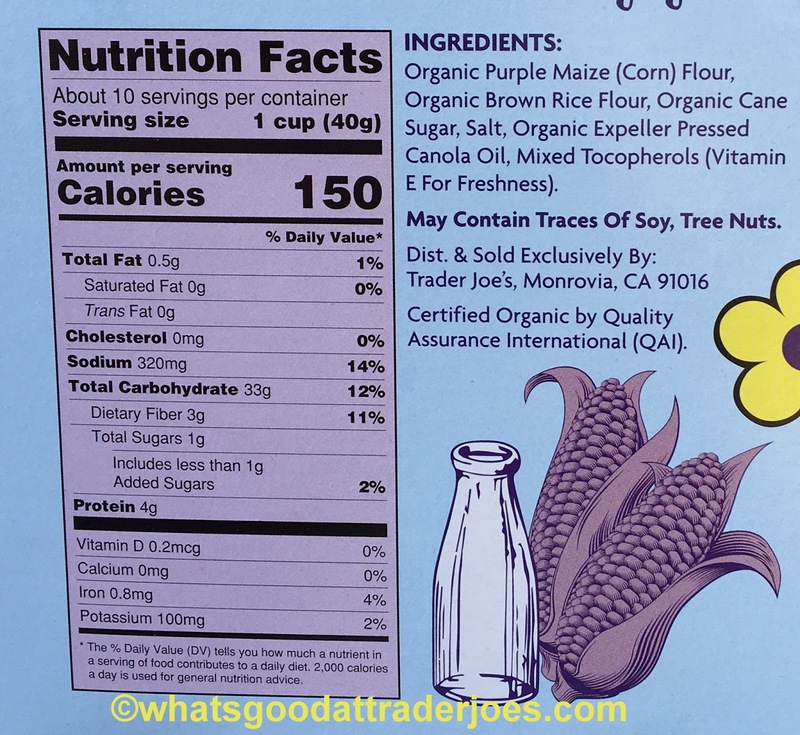 That's what the back of the box says about Trader Joe's Organic Purple Maize Flakes. I get the punny Hendrix connection and motif, and there's always been a hippie/hipster vibe to TJ's (at least in ym area), so it kinda works, but still. A breakfast cereal. It's corn flakes. I can understand folks looking for a transcendental expereice in a bowlfull of something or another, but...cereal? Well, alright...I guess. 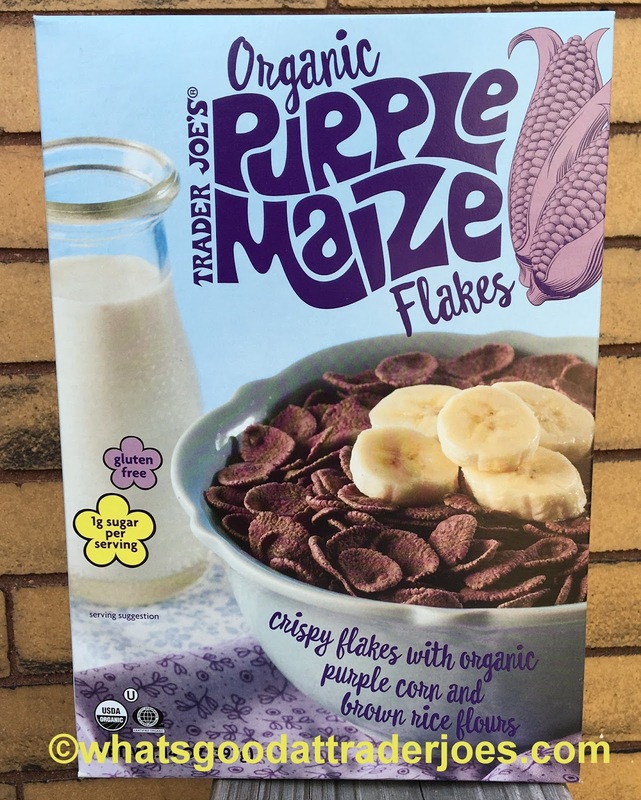 The obvious draw, Woodstock-era connotations aside, is the fact that these are purple corn flakes. Oooooh, pretty, right? My kids like purple, maybe they'll eat them. 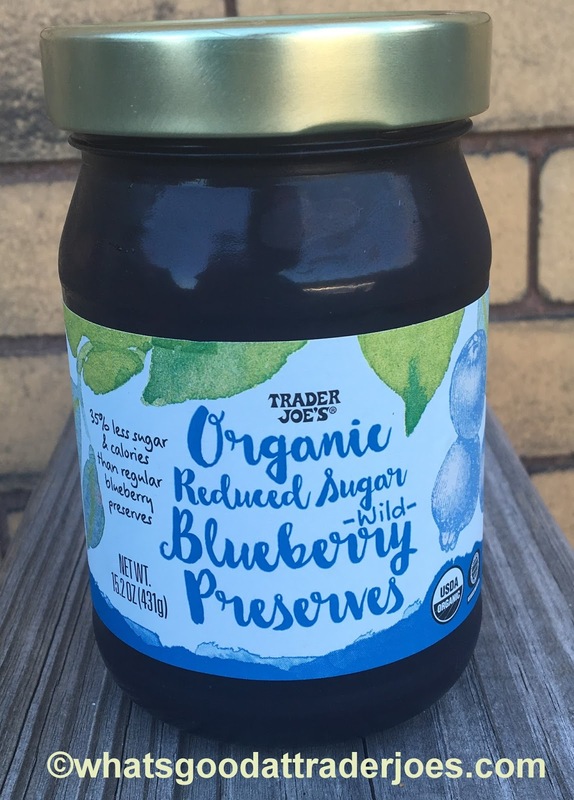 Organic is, as always, a plus. 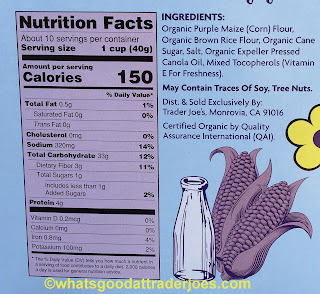 That "harmonious convergence" the box speaks of is between purple maize and brown rice flours, additionally making this cereal gluten free. All well and good. Kinda groovy. Cereal for the people, man. Salt. The corn flakes are downright palpably salty. It's enough that if TJ's were to market these as tortilla chip cereal, I would think it appropriate. I kinda want to dump some salsa on the cereal to give it a try. it just might work. 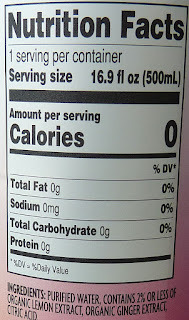 Granted, the saltiness does kinda dissipate once milk is poured on and a little sugar added, but still...there's no reason to get 1/7th of my daily sodium in one cup of breakfast cereal. And no, the flakes won't turn your milk purple either. I'm alternately gracious and disappointed. Overall, though, it's a decent enough cereal. Both my kiddos liked it enough to have multiple bowls, while both Sandy and I snacked on a few extra handfuls. I don't do cereal often, and neither does Sandy, so this is definitely on the fence as a repeat purchase. 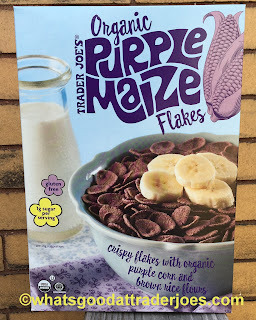 Not that there's anything too horrendously wrong, but once our girls' fasconation with purple cereal goes away, it'd take forever to get through a box. Not terrible, not awesome, and certainly not transcendental. Maybe the purple maize isn't all in my brain. Good. Long before we met each other, Sonia and I both had opportunities to travel to Paris, independently of one another. We each did the Eiffel Tower, Louvre, Notre Dame, Champs Elysee touristy thing and had a lovely time in the City of Light. Someday, we hope to return as a couple, but for now, it's fun recounting the few days we had there and comparing our experiences. We both found Parisians to be kind and helpful, despite the many stories we'd both heard about how rude they were to American tourists. We both ate at a French McDonald's—because, you know, it doesn't get more authentic than French fries in France, complete with mayonnaise and very vinegary ketchup. And, of course, we both ate chocolate crêpes from street vendors, because they're everywhere, inexpensive, and scrump-dilly-icious. 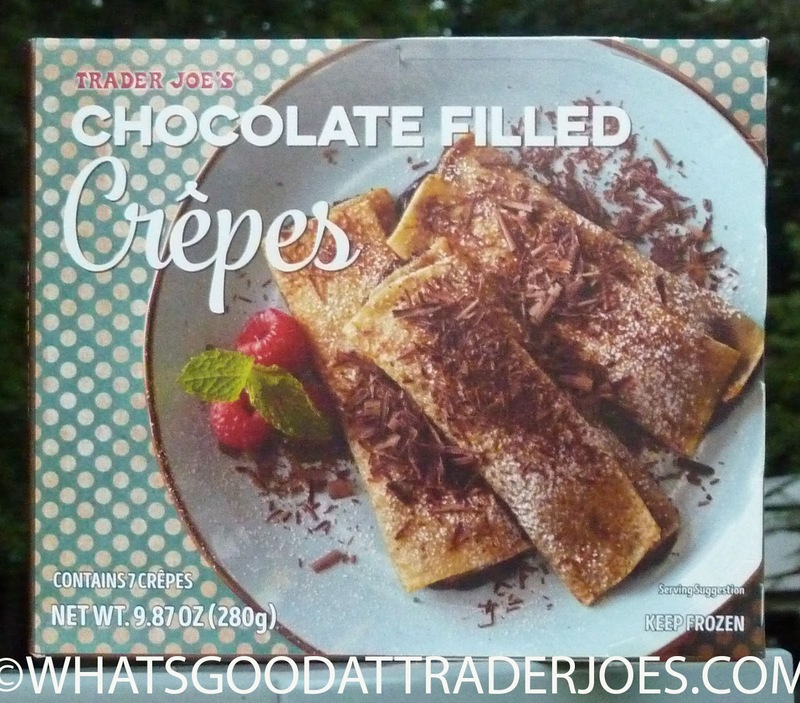 These Trader Joe's crêpes aren't too far off from the authentic street cart crêpes we both had all those years ago, but there are a few distinct differences. First, the flour portion of the pastries is a little too thick here. When heated according to the instructions, the bread winds up just slightly stretchy and almost chewy—not to the point where it's unpleasant, but we both remembered a thinner, crispier crust on our crêpes. Straying from the printed directions, Sonia proceeded to heat one of the crêpes on the stove top in a little butter. The texture became significantly more crispy, and the flavor a little more indulgent. We preferred them that way, although heated in the oven, as per the instructions on the box, wasn't bad by any means. I even ate one straight out of the box after thawing for an hour or two. Honestly, taste-wise, there wasn't a whole lot of difference from the ones we heated in the oven. The shape of the crêpes is a little strange to us. The crêpes we'd always had before—not just in Paris, but most of the offerings we've tried stateside—were like thin pancakes folded over in a semicircle. These are more like little rolls, folded over multiple times. It's nothing to complain about—just a difference we noticed. The filling here is a nice thin Nutella-esque chocolate creme—not too sweet and not too bitter, either. Just about perfect. 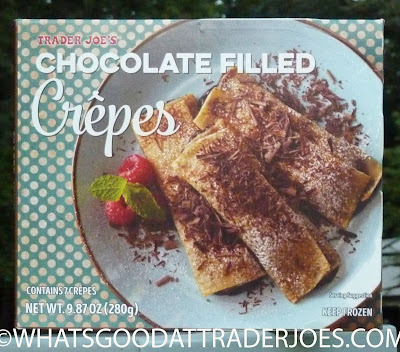 With a price point of $2.69 for seven crêpes, this is one of the more accessible international snacks from Trader Joe's. Four stars from me. Sonia was going to go with three and a half until she tried her own stove top butter-fried heating method. After trying them that way, she's ready to give a solid four. 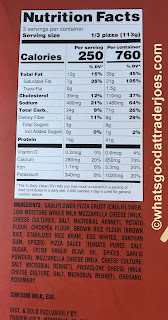 A few weeks back, we put out a review of a TJ's cauliflower pizza crust, and had kinda mixed review. Haven't had it since. Main issue was the texture - it just didn't feel like actual pizza crust. Too wet and dense and soggy. Since then, from what we understand, the prep instructions have been revamped to baking before topping the crust, then baking again. Seems like a high likelihood of that working out - we just haven't seen it in stores to try for ourselves. Have you? Let us know. 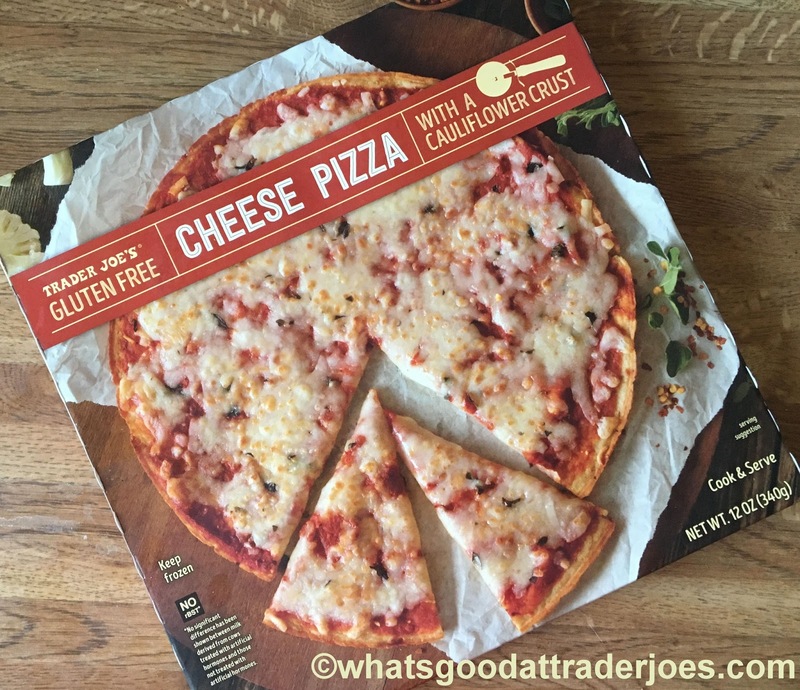 Semi-relatedly, here's Trader Joe's Gluten Free Cheese Pizza with a Cauliflower Crust. Pizza with all the guesswork taken out of it - slide out of box, insert in oven. No fuss, no muss. 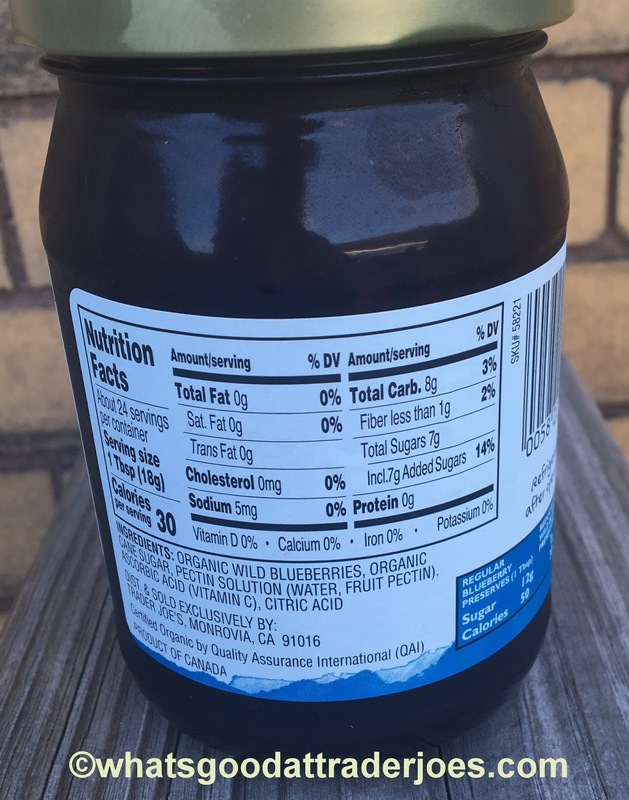 Now, I have no need to follow a gluten-free diet - I have a preference to, when convenient, just out of occasional adherence to a semi-paleo friendly diet. * Helped me lose a lot of weight, helps me keep it off. 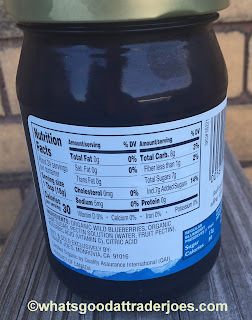 That being said, it's hard for me to not compare gluten free products to their glutenfull counterparts, and usually, I find them a little "lacking" or "not to my taste" or whatever simply because of what I'm used to. But...I'm really surprised by this cauli-crusted pizza here. I am going to make the comparison to a "normal" cheese freezer pizza, and feel very comfortable doing so. Mostly because, side by side, i don't think I could tell them apart. Seriously. The crust here gets crispy, a little crackery, while browning up easily and keeping all together. Must be the rice flour and all mixed in. It tastes and feels as "normal" as it can. Nothing too special about the cheese or sauce - it's the standard fare. One can easily top the pizza with whatever kind of toppings you'd like, and it'd work for sure. Nothing to really stand in the way - it's just a cheese pizza. Which is a compliment, I think. The pizza cost $4.99, which sounds maybe a little high at first, but for what it is versus comparable products, it's a reasonable enough value. I'm not sure Sandy and I will make a huge deal out of making a repeat purchase of it, but we all liked it enough. Even our now five year old, who easily turns up her nose at anything she doesn't like - she ate almost half the pizza herself. Not too much else to say - a good pizza that's not quite upper crust. 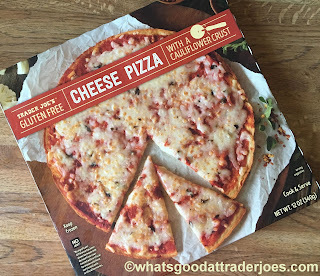 * Yes I realize there are very few things less Paleo friendly than a plain cheese pizza. Avocados are simply delicious. When they're just ripe, there's nothing like 'em. We're huge fans of putting them in salads, sandwiches, burgers, quesadillas, or anything else we can justify throwing them into. And who doesn't like chips and guacamole? But yogurt? That seems just a little weird to me—almost along the same lines as putting bacon in a chocolate bar or elephant dung in candy bites...well, okay, that last one isn't actually a thing...yet. But you get the picture: it almost seems like certain products carry a bit of shock value just by stating their name. And if it works, great. But if it doesn't...everybody's like, "Um yeah, I didn't think that would work, so why did TJ's?" 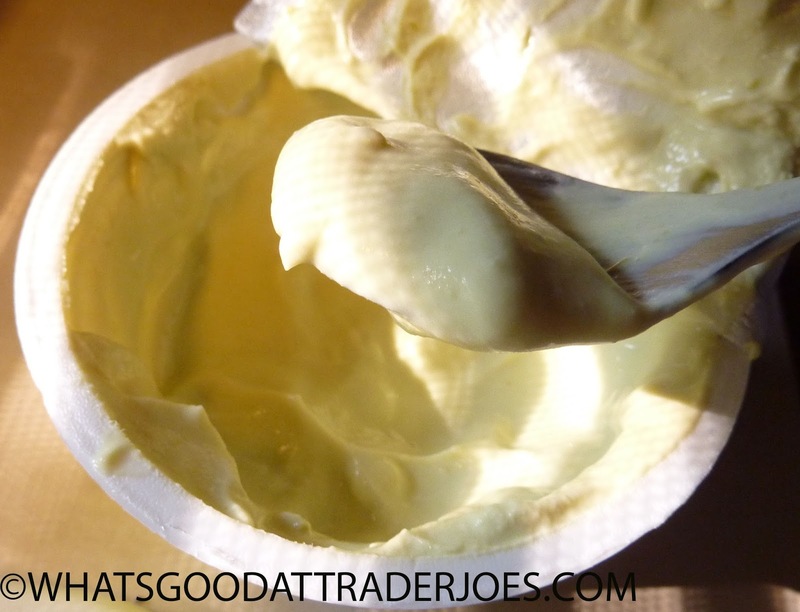 Case in point: avocado yogurt. It doesn't sound like it should work, and in my humble opinion, it simply doesn't. The best part about this product is that it doesn't really taste that much like avocados. It's much more citrusy than avocado-y. But there's enough avocado to make your mouth a bit confused. It's sweeter and more citrusy than yogurt-based guacamole, but it's sour and tangy like most Greek yogurt, and then there's still that distinct, earthy, almost nutty essence of avocado—and at least my personal taste buds insist that it just doesn't belong in yogurt. I gave it the old college try, but I'm not feeling it. Two stars from me. 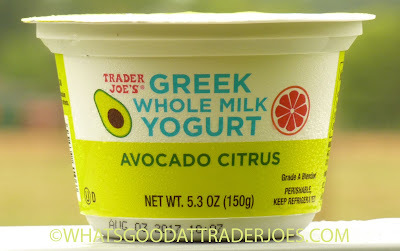 If it had been "Citrus Greek Yogurt with a Hint of Avocado," then maybe, just maybe it could have worked. Interesting concept though, I guess. 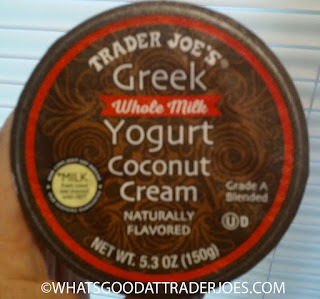 And I don't feel super let-down, because my expectations for this product were much lower than the ones I had for, say, the PB&J Greek Yogurt. Sonia's only comment: "I don't hate it, but it's just weird." Three stars. "I want you to review these just for all the Puff Daddy references you could make." Love ya, sweetie, but Puff Daddy/ P. Diddy wasn't my jam back in the day. 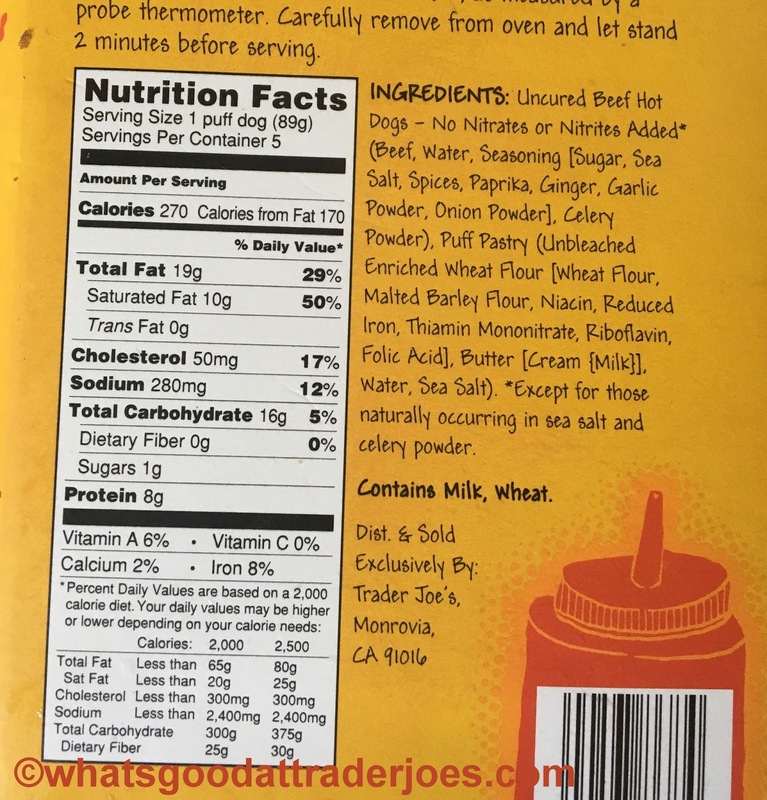 I'm familiar enough with the work of Mr Combs, but enough so that I could off a bunch of references in relation to Trader Joe's Puff Dogs? Nah. I mean, "Puff Dog" does sound like a mid-to-late-'90s rapper. Probably was one, or could have been like a super dup between the aforementioned Diddy and Snoop Dogg. As the story goes, the only reason we bought these was at the behest of one of the local TJ's employees, who knows who we are and what we do, and we were strongly advised to buy them. Why that is, I'm not sure, as I wasn't there. I personally wouldn't have. I have nothing against a quality hot dog wrapped up in a buttery biscuit type deal, but...it's easy enough to do on your own if the mood hits. Which for us is pretty rare...I don't think I've done this since college. Maybe even before. Aside from micro hors d'ouevres, of course. Those are tasty. And yeah...that's what these puff dogs taste like. A fully grown hors d'oeuvres. There's nothing special, unique, or all that interesting about them, to be quite honest. I mean, yes, there's quality to be had here - the smoky beef hot dog in all its uncured goodness is rather tasty, admittedly - but, there's not much to be had otherwise. 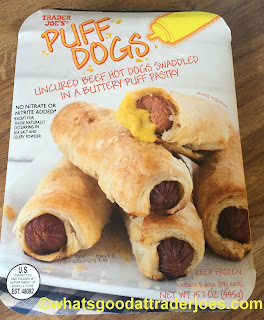 The puff pastry is standard, run of the mill flaky and a little buttery, and that combined with the beef dog do have a little greasy comfort food vibe that would taste even better after a few beers, I'm sure. But there's nothing else, really. 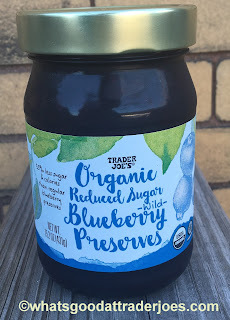 There's no "Trader Joe's-y" twist to them, like an unexpected seasoning or fancy cheese or some other novelty to them. It's tough to even argue a convenience factor, and at a somewhat premium price ($4.99 for five dogs - a buck per pup), you can get more bang for your buck by buying a pack of frankfurters and a tube of crescent rolls seperately and get much the same result. Plus - this is probably silly - I hate the picture on the front. 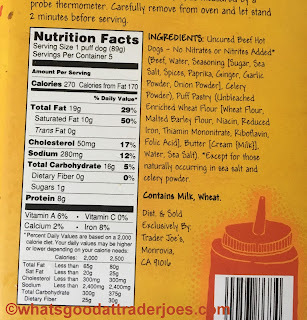 That yellow stuff hanging off the bitten-off hot dog? Is that supposed to be nacho cheese or day old scrambled egg? Yes, I know, probably mustard as evidenced by the cutesy mustard bottle up top, but still...there's something unsettling about it to me. Especially with the word "buttery" in close proximity. Yes, I'm weird. Can't nobody hold me down. It might not be all about the Benjamins, but for the mo' money for these, I don't want mo' problems. Come with me or I'll be missing you...ugh, I can't do this any more. Probably not a repeat buy. They're okay, but what they'd best for is what P Diddy was best at: Sampling. 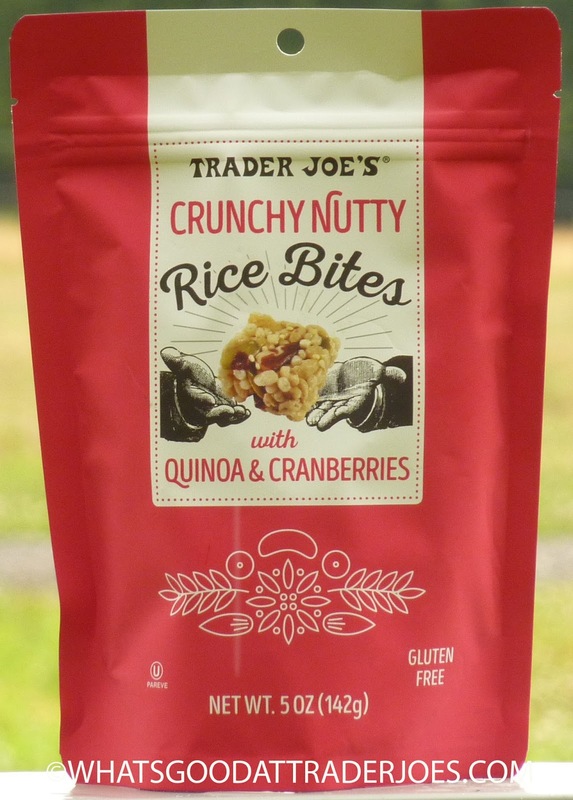 The little description on the back of the bag states: "When a lack of snacks is what ails you, a handful of Crunchy Nutty Rice Bites with Quinoa & Cranberries is the cure." How appropriate after having just watched A Cure for Wellness last night. What a disturbing film—I mean, genius in many ways, but thoroughly psychologically disturbing. What's even more disturbing is that I can readily identify with characters in such films far more than, say, anything that might be considered a normal family film. But if you've seen the movie, you'll know why I was immediately reluctant to consume something that a random quack medicine man claims is a "cure" for what ails me. The cover art, featuring one of the crunchy nutty rice bites levitating supernaturally over a pair of hands and radiating some sort of angelic rays, didn't help the case for these mysterious snacks. But try them I did, and honestly, I'm not sure if I'm relieved at this point, because these things are so addicting, I'm a little worried there's more to them than their constituent parts listed on the ingredients. I mean, I've tried plenty of crispy ricey snacky things before, and plenty of treats laden with cranberries and quinoa, but none have had quite the same appeal as these sweet, crunchy bites—at least nothing in recent memory. At first glance, some of the nuggets resemble little square pieces of sushi, with multiple muted colors resting on bite-sized beds of rice. But the similarities to sushi end there, as these rice bites flaunt a brittle crispness and surprising amount of sweetness. Tartness from a generous amount of cranberries tends to shine through in most of the pieces. 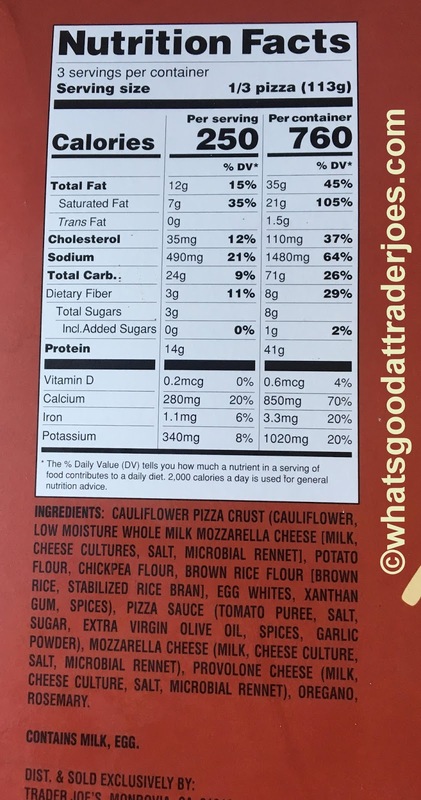 There's also a nuttiness in the majority of bites which I'd attribute to the pumpkin seeds before either almonds or cashews, or quinoa for that matter. 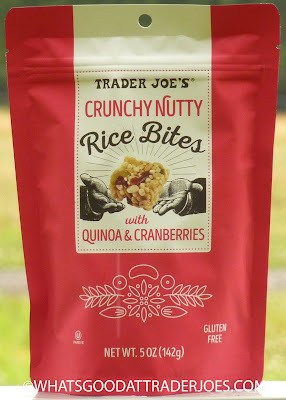 I mean, there's definitely quinoa in there, but the fact that it's mentioned in the title of the snack seems more of a gimmick than anything else. I guess "pumpkin seeds" or "pepitas" just doesn't get the granola crowd riled up like "quinoa" apparently does. I'm gonna go with four and a half here. 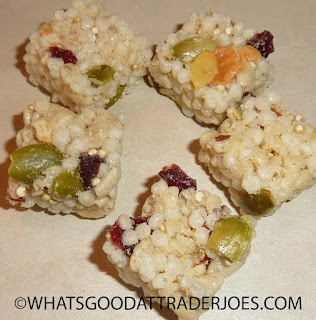 According to Sonia, they're kinda like "healthy, dry Rice Krispies Treats." That about sums it up. Four stars from her. "This was obviously made by someone who hates coffee." That's an actual recent quote from my mom, and in what actual context, I forget. Doesn't matter, I may be adopting it to describe any coffee that I don't like. I'm beginning to realize that I need to have my coffee just the way I like it, or I get cranky. This must be one of those signs that I'm getting older, I guess. File it alongside: Realizing I can play Pearl Jam too loud while in the car by myself. Recognizing the need for supportive walking shoes. Not recognizing anything on the radio except the classic rock station. Anyways, here's yet another cold brew concoction from our main man here. This time, it's Trader Joe's Coconut Cold Brew Coffee Concentrate. Well, okay. Flavored coffees aren't really my deal, per se - coffee should taste like coffee, ya whippersnapper - but heck I'd give it a try. 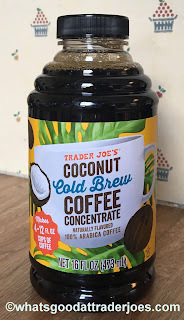 I like the idea of cold brew concentrates, mostly because I don't like the idea of paying three or four bucks from a coffee shop every time I want one. But the trouble always seems to be getting the ratio of concentrate to diluent correct - too much of one or the other throws it way off. Seems to be the same case here. I measured, I tried, I recalled my seventh grade chemistry teacher saying to measure the meniscus...still couldn't get it quite right. So there's a part of the problem I'm willing to own. But the other issue? It's just not very good coffee. It's the coconut. In theory, it sounds good, but to me, it doesn't jive. The coconut just kinda clanks around, with almost a tinny or metallic taste to it. Ugh. No likey. It's obtrusive. And it's tough to tell for sure, but the coffee almost seems to rely heavily on coconut for flavor, instead of the natural earthy goodness that actual good coffee delivers. If you need to add flavors to make your coffee drinkable, to me, it's just not that good to begin with. I realize I may be in the minority here. That's okay, fire at will. Sandy absolutely disagrees with me, noting that she liked making hers with sweetened almond milk and ice. I think I took a sip of one of those, and admittedly it was almost passable. A terrible idea, though, is mixing this with something like a flavored LaCroix...we tried it, it's supposed to be trendy....it also tastes awful. Sandy would buy again happily, while I'd just as happily mumble about it if it were to reappear. Maybe it's made not by someone who hates coffee, just by someone with a very different opinion than me. Bah. My blog, my score. Get off my lawn. Nothing but frozen coffee on a stick. No more, no less. Great if you love coffee—not so much if you're craving something a little more indulgent. Sure, there's sugar and cream. It's not like they used plain black coffee. But if you were expecting something along the lines of a Fudgsicle with a coffee twist, you're in for some disappointment here. Just like real coffee is mostly water, so too is this popsicle. And it tastes that way. I'm no coffee connoisseur, but if I had to wager what type of coffee is employed here, I'd say it's a lighter roast. It's not even a particularly bold or rich flavor. 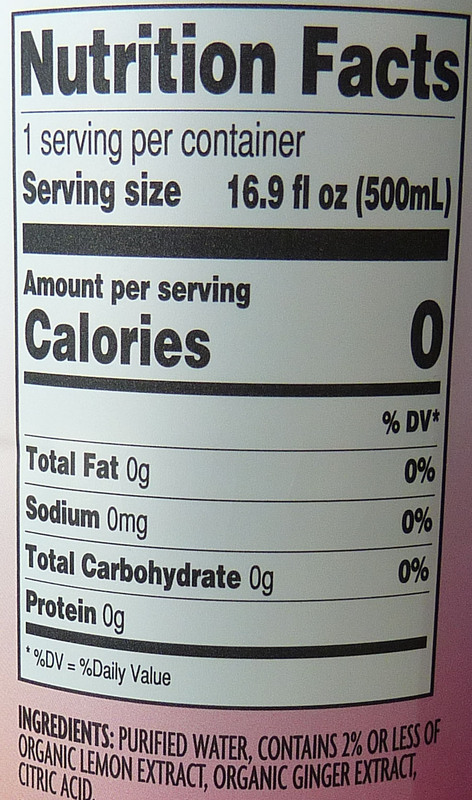 The refreshment factor is potentially pretty high, but again, the indulgence factor is surprisingly low. 40 calories per bar says it all. 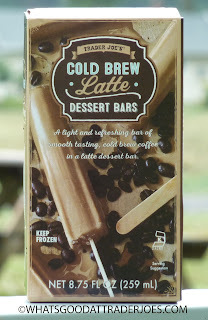 Kosher, convenient, and inexpensive ($1.99 for five), this product is great for coffee-lovers who want to get their daily caffeine in a cool new way—and possibly to beat the heat at the same time. 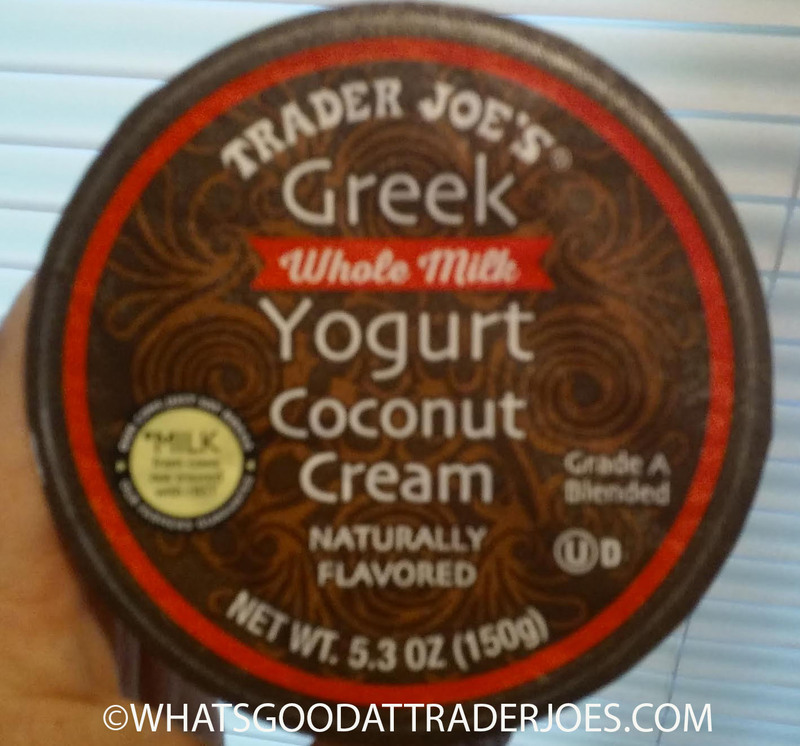 There's nothing chalky, mocha-y, or nutty here, like another recently-reviewed latte product. If I had to wager which item would be more popular with the coffee-craving crowd, my money would be on these java-sicles. Predictably, Sonia, who loves coffee, enjoyed these bars more than I did. She does wish they were a little sweeter and perhaps a tad creamier, but she can appreciate them for exactly what they are: simple coffee-flavored refreshment. Three and a half stars from her. I'm not a coffee guy at all, but I have to have respect for this product just for its simplicity, refreshment-factor, and potential appeal to true coffee folks. Three stars from me. Ah, tomorrow's the Fourth of July. And there's nothing quite as Murican as lemon-ginger-infused water to celebrate Independence Day. Let's take a look. Imagine you just consumed a plate of lemon ginger chicken. Now imagine you rinsed off the plate and collected the water from it. Imagine further that you had a temporary lapse in judgement or some kind of heat stroke and decided it would be a good idea if you drank said rinse water. Ahh, refreshing right? Depending on the temperature of the water...perhaps. But still a pretty weird taste. Yeah. I'm not feeling it. And I like lemon and ginger just fine. And in case you're wondering, no, this product doesn't taste like chicken. I just couldn't think of any other legitimate reason you might have lemon and ginger on a plate. The ghost of lemon and ginger present here is just potent enough to ruin the super-neutral taste of plain water, and yet it's not strong nor sweet enough to be any kind of delicious chuggable beverage. And another thing: the write-up on the packaging claims this product is "Hydration with flare." "Hydration with flare"? Did I somehow miss that this water is flammable? Does the water have a high enough alcohol content to serve it flambé? Or did they mean "flair"? Or is this use of the word "flare" somehow acceptable here? Was the water flavored with road flares? So if you ask me, just go ahead and skip this hippy dippy nonsense and go drink a tooth-rotting, high fructose corn syrup-laden Coca-Cola tomorrow while you watch those fireworks. One won't kill you. Coke is deliciously American, and this stuff just isn't. Fair comparison? No. Apples and oranges? Sure. I'm fresh out of more appropriate comparisons. This heat's getting to me. Sonia thinks she'd just rather drink plain old water for refreshment—or maybe even sparkling mineral water. I agree. One star a piece. Bottom line: 2 out of 10.